I saw this code in (New FT 300 feature). I also want to program in similar way for my application. I'm sorry, I wasn't aware of it but it's the same function that has been renamed. thanks that helped me . when I enter the code " get _applied_tcp_wrench(4)>25" and then as I run the Program there is an error telling it is not defined. What is the reason for that? 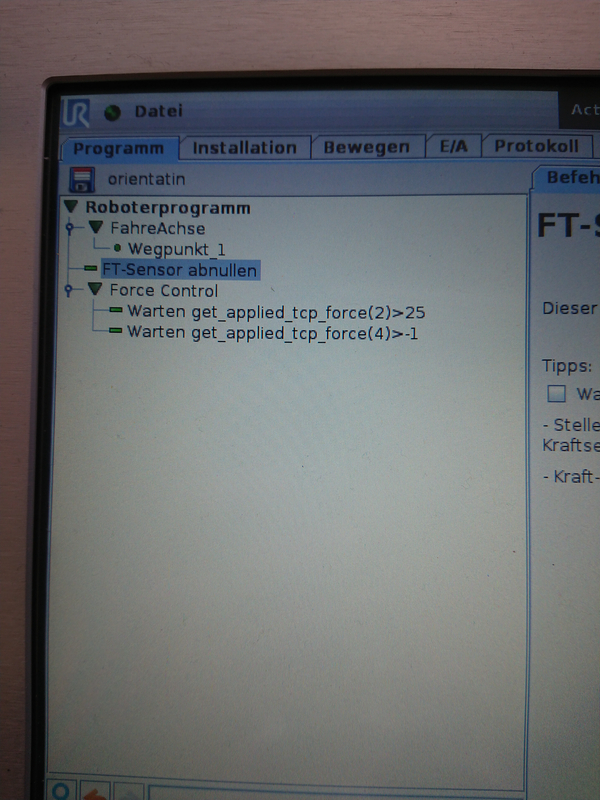 anoher question how is this code different from " get_tcp_force() " ? What version of poly scope are you running? That is a rather new feature. I tried the (reorientation demo with FT300). When the robot moves in the z-axis waiting for the 25 N to be detected and as soon as it detects it does not orient perpendicular. What should i do so that it can orient perpendicular to the surface. What are you trying to align exactly? You'll need a contact large enough to be able to align it on a surface. If you try for example to align a part with just a few square inches of contact, it won't be possible. The larger the object, the more moment will be applied so it will be easier to align it flat on the surface. 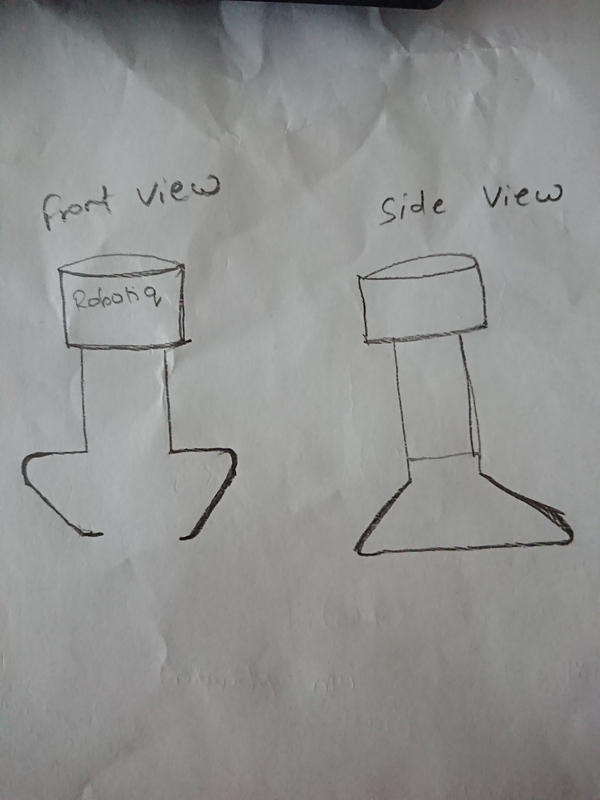 I have drawn roughly the front view and side view of thr instrument to be alligned. Its moving down in the slant position (Not perpendicular to the surface). When it detects 25 N on one tooth of clamp. Instead of alligning perpendicular to the surface it retreats back. 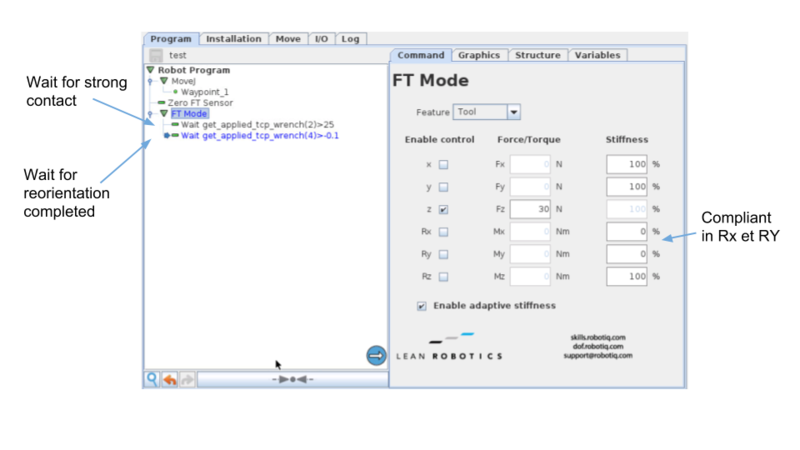 Could you please post a picture of your program and the setting in the force control node? To avoid bounce back, you can try to untick the adaptive stiffness and set your own. The higher the stiffness, the slower the compensation. I would start with 80% stiffness for the z axis. But it is very likely that the point of contact aren't large enough. What is the size of your tool? or could you please post a picture of your setup?